Hello and welcome back to Episode 6) of Active Listening in Jazz. My Name is Dan Adler and if you haven’t watched the previous episodes please check them out on the playlist on YouTube. So I ended Episode 5) Harmony and Improv by saying that Jazz is a unique form of human expression. And I want to go a little bit deeper into that. What does that exactly mean? So there’s a very famous quote by Charlie Parker who is one of the innovators and creators of the Bebop Jazz style: “First you learn your instrument, then you learn the music, then you forget all that and just play“. Your conscious mind, which is learning all about your instrument. Learning the technique. Developing your touch. Developing your sound. Developing all of the mechanical aspects of your playing. And the performance aspect of your playing. And then the Music which is of course the whole history of Jazz. The Form that we talked about ~ knowing the form of the songs. Understanding the relationship between Chords and Scales. Understanding all the elements that can become part of the vocabulary of musical improvisation. And then there’s the process of stuffing all of that into your subconscious and then having that come out as an improvisation. So before we start with some Jazz examples I’d like to show you a little clip of what has modern neuroscience have to say about this relationship between the conscious and the unconscious mind. “So the human brain is 3 pounds. It contains tens of billions of neurons. Neurons are the specialized cell types in the brain. And every neuron is about as complicated as the city of New York. There are so many connections between these neurons it numbers in the hundreds of trillion and if you took a cubic centimetre of brain tissue, there are as many connections in there as there are stars in the Milky Way galaxy. Now even stranger is that essentially the entire operation of this, the most complicated system we’ve found runs entirely under the hood of conscious awareness. And this is what leads to the idea of the unconscious brain. And it turns out that the conscious mind, the part of you that flickers to life when you wake up in the morning. That’s the smallest bit what’s happening in your brain. That’s the broom closet in the mansion of the brain. So taking what David Eagleman says in this little clip we can begin to interpret the last part of Charlie Parker’s statement. What does it mean to just play? When a Jazz musician is in a performance situation they are not in the same state of mind as you might be when you’re taking an exam or giving a technical lecture on some topic. They are rather in a situation where they are trying to tap their subconscious mind into which they have stuffed all of this information and all of this knowledge. Trying to tap into that in order to get that incredible idea and to develop it and to develop a whole solo. And to develop a whole story and to put it together with all of their experiences and their emotional states and of of that. And none of that is easy. 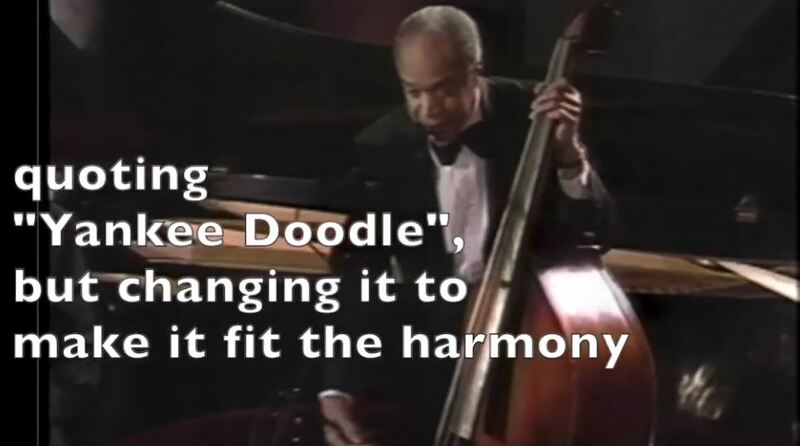 And so Jazz musicians have gone to great lengths to figure out how they can connect into that C process. And this is really is where the Active Listener comes in and we’ll see that in the continuation of the episode. So let’s look at some historical examples of how Jazz musicians have tried to connect the improvisational process into their whole body experience. And again this has to do with the real-time aspects of Jazz: You have to be creating on the spot. And in order for that to happen you have to have your whole body integrated into the experience. It can’t just be your brain telling your fingers what to do. You have to be singing the melodies in your mind. The melodies have to be connected to what you’re playing. And they have to be connected to the chord changes, the form and to what the other players are doing. And all of that requires a level of concentration and at the same time a level of letting go and being a little bit distant from what is happening. And this combination is unique and cause Jazz musicians sometimes to do physical things that sometimes members of the audience can’t quite understand what they are doing. And so let’s start with an example of one of the quirkiest personalities, but also one of the most ingenious: Thelonious Monk. And he was known. you can find many videos of him on YouTube. He was known to be dancing on stage while other musicians were playing their solos. Getting into it and getting himself ready to do his solo. And when he took his solo you can see ~ and I’ll show you a little clip here of how he gets his whole body into it. And how you can see that the process about thinking about what he’s playing is not just an intellectual process. There is an an intellectual process you go back and analyze what he’s done. It’s amazing the way the notes land exactly on the time and they went the way the phrases start at a certain point. And end at exactly a certain point. And how one hand completes what the other hand is doing. But you can also see that he’s put his whole body into the whole experience. And it’s not just a mental experience. In the next clip we’re going to see Bud Powell. Another important innovator from the BeBop era and in this case you’re going to see that he is vocalising to himself what he is playing. And it’s not exactly coming out as him singing along with his solo. You don’t hear the pitches that he’s singing but you hear the process where his body and his mind are integrated in the creation of the melodies. The melodies are very intricate but they are not just coming from in the intellectual process of thinking ‘ok this note follows that note. This note is because of that‘. All of that stuff is happening in his subconscious mind. But what you see is the integrated experience of this whole body being part of this creation. Probably the most famous manifestation full body experience as part of the improvisational process is Keith Jarrett. So let’s watch a little clip of Keith Jarrett doing his thing. Getting into the zone ~ getting into the flow and really putting his whole body into it. Then let’s hear how he explains what process he’s going through. “When I’m out there and there is just a piano, it’s like my body knows what to do. It’s like my left hand knows how to play. And If I tell it what to play ~ I’m stopping it. Not only am I stopping it, but I’m stopping it playing better than something I can think of. This is like being over saturated with input and it actually comes through your entire body. So far we’ve looked at some of the great pianists and how they connect their entire body into the experience. But this also happens with other instrumentalists and let’s look now at a famous example of a flute player, Jeremy Steig who also had a way of integrated his breathing in a vocal way into his playing. And this is less common because horn players are already involved through the process of breathing into their instruments. 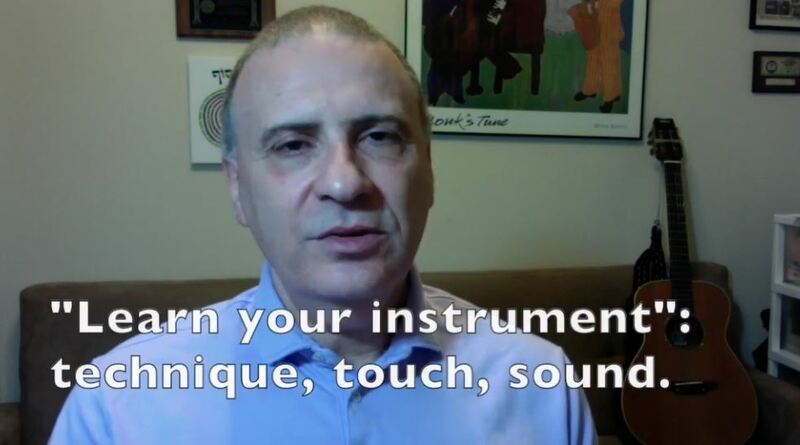 Their whole body is involved but this is a great example of vocalising as part of the process that just demonstrates that there is a direct connection between all your physical aspects and the music that you are playing. So far we’ve seen great examples of musicians who vocalise and kind of integrate their whole body into the experience of generating an improvisation in real time. But now let’s look at some examples of amazing musicians who can actually sing along with what they are playing. Or maybe it’s the opposite they’re playing along with what they’re singing. It’s an integrated process. It happens at the same time. We don’t know what the brain process exactly is. The chicken or the egg but we know there is an integrated experience where what you are hearing is the person is singing and playing at the same time. Something which never existed before in their mind. And their subconscious mind is somehow creating all of this and putting it out there for the audience to enjoy. Did you see the woman at the end? That’s the Jazz audience you want to be ! The active listener who is following along and is enjoying every joke and is emotionally involved in everything the players are doing. So here’s another example of a great singer and piano player Tania Maria and look at how she integrates her piano playing and her singing. Did you catch that bit of interplay at the end with the drummer and the rest of the group? If not you should rewind and check that out. So here’s another very famous guitar player. Toots Thielemans, a Belgian player who is also very well known for his harmonica playing. And here he is doing what he is known to do which is guitar and whistling at the same time. Again it’s the same idea of the process. Your mind is creating the pitches and the rhythms and the improvisational logic and all of that is being transmitted to your whistling and the guitar. Hopefully you’ll enjoy this amazing integrated experience. So getting back to the theme of our episode, as an Active Listener what is required of you? Here is Keith Jarrett’s opinion: “Audiences think I don’t like them. But the truth is I need them almost more than any other performer that comes on to the stage in front of them. I just need them to do a few simple, easy things: try to concentrate“. I want to end this episode with the opening scene from the 1988 movie called ‘Bird‘. This is a movie created by Clint Eastwood about Charlie Parker. Now most of the movie shows his dark side, his destructive side and as such I’m not a huge fan of the movie because it doesn’t show the genius of Charlie Parker. It shows the tragic side of Charlie Parker but the opening scene is a magical depiction of what an involved audience would look like. Maybe it was a historical scene that was recreated. I don’t know for sure but you see Forest Whitaker the actor playing Charlie Parker and his lip syncing and hand syncing playing and you see the audience. And the audience you’ll see even though they are not quiet ~ they are noisy, they are drinking, having a good time, but you can see them very much engaged with the music. Responding to it. Clapping hands, being part of it. And that is the dream of every Jazz musician when they are performing live. 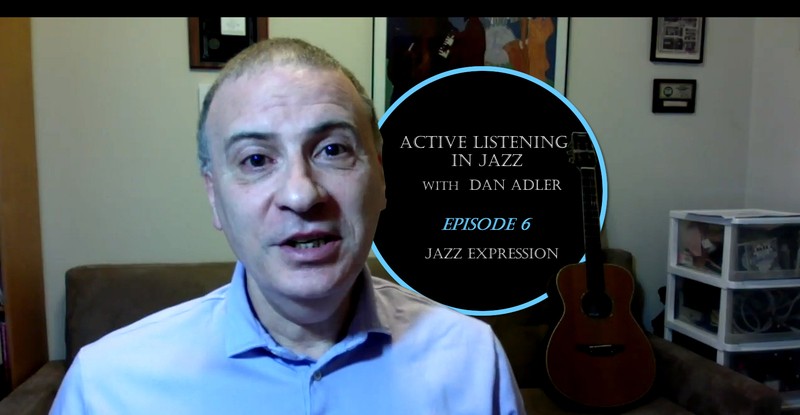 So this concludes Episode 6) Jazz Expression of Active Listening in Jazz. I hope you’re beginning to understand some of the full body experience. The conscious and unconscious experience that Jazz players are going through, and your role as an active listener in Jazz.